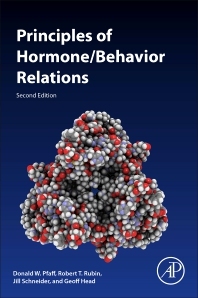 Principles of Hormone/Behavior Relations, Second Edition, provides an introduction to the underlying principles of endocrine regulation of behavior, a newly emerging area of research within neurobiology and endocrinology. It addresses the properties of hormone/behavior relations, including the influence of family background, timing issues, neuroanatomical features, cellular mechanisms, and the importance of environmental context and evolution. This new edition incorporates critical advances in the field, also including increased coverage of hormonal influences on food intake, and on the cardiovascular system. The addition of entirely new principles provides further coverage of epigenetics and appetite. Thoroughly revised and updated, this book is an ideal resource for neuroscientists and researchers engaging in this rapidly expanding field of study. Donald W. Pfaff heads the Laboratory of Neurobiology and Behavior at The Rockefeller University. He received his scientific training at Harvard University and MIT and is a member of the National Academy of Science and a Fellow of the American Academy of Arts and Sciences. Pfaff's laboratory focuses on steroid hormones and brain function, interactions among transcription factors, luteinizing-hormone-releasing-hormone neurons, and genes influencing neuronal functions. He is the author or coauthor of over 10 books and more than 800 research publications. Professor Jill E. Schneider has been teaching undergraduate courses in Behavioral Endocrinology and other topics in neuroscience at Lehigh University for over 25 years. She received graduate and postdoctoral training in biology and neuroscience at Wesleyan University and the University of Massachusetts, respectively, and was awarded the Frank A. Beach Award from the Society for Behavioral Neuroendocrinology for outstanding research in behavioral neuroendocrinology in 1991. Professor Schneider’s National Science Foundation-funded neuroendocrinology laboratory is focused on metabolic and hormonal mechanisms at the interface of reproductive and ingestive behavior.